Your gallbladder -- a small, pear-shaped organ -- is responsible for storing bile for the liver. Bile is used to help break down fats. A gallbladder attack can occur as the result of a gallstone blocking the ducts that connect the gallbladder to your liver. This can cause intense pain. There are certain foods that trigger gallbladder attacks. If you have gallstones or gallbladder disease, you should avoid these foods. Junk foods can trigger gallbladder attacks. The high amounts of fat found in most junk foods can be difficult for your body to break down. Junk foods to avoid include chips, cookies and cakes. If you have a gallbladder condition and are looking for a snack food, consider dried or fresh fruits. If you have a gallbladder condition, you should avoid dairy products that are high in fat. High-fat diary products, such as ice cream, can trigger a gallbladder attack. If you are looking for a healthy, alternative that will not contribute to a gallbladder attack, consider low-fat yogurt or frozen fruit bars. 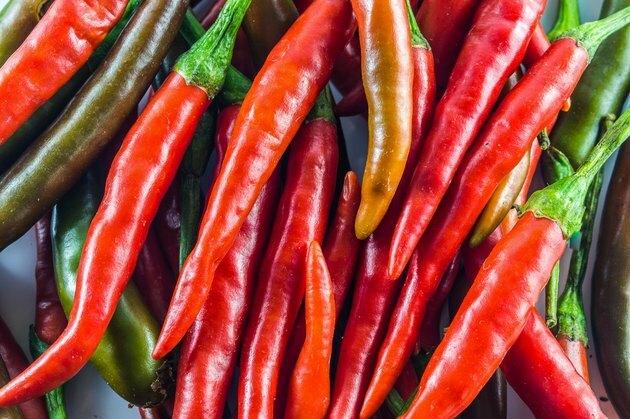 Peppers -- especially red hot chili peppers -- along with other spicy foods are often used to spice up traditional dishes and are commonly found in Mexican foods. Spicy foods can lead to increased gallbladder attacks and intense pain. If you are looking to spice up a dish, opt for a more bland pepper -- such as green peppers. Often used in pasta and potato salads as well as a condiment on sandwiches, mayonnaise can trigger a gallbladder attack. Eggs, fatty oils, salt and other seasonings make mayonnaise a condiment that is very high in fat. To add flavor to a sandwich or other food, consider using an organic ketchup or a mustard sauce that is not spicy. Spicy mustard can also have an effect on your gallbladder. Avoid using excessive spices as well. If you have gallstones or gallbladder disease, you should refrain from consuming fatty meats such as beef and pork. Excessive fat can be difficult for your body to digest. When consuming meat, stick to lean meats and consume plenty of fish, turkey and poultry. You should also opt to cut all the fat from your meat prior to consuming it. There is no specific list of foods that all patients with gallbladder disease should eat, nor is there a specific list of foods that individuals with gallbladder disease should avoid -- even while experiencing a gallbladder attack. Each individual body reacts differently to different types of food. What triggers a gallbladder attack in one individual may have absolutely no effect on an another individual. Talk to your doctor about a diet specific to your condition.